"Yesterday," sings Paul McCartney, "all my troubles seemed so far away." It is the Ed Sullivan Show, and as his fellow Beatles wait in the wings, Paul does it on his own with nothing but an Epiphone Texan acoustic guitar and an off-screen string quartet. One month later, on 12 September, 1965, 73 million people watch the performance on TV - among them some of my American family: brother James, who is 12, cousin Goldie, just one year younger, and me, about to turn seven. "This is so old-fashioned," complains James. "Shh," interjects the awestruck Goldie, today a grandmother who staunchly denies that she ever collected Beatles cards. I say only: "It's such a pretty song." I know that if I were to insert my present-day self into that scene, I would say something like, He doesn't really have much of a fingerpicking technique, does he? His hands are all over the place. Or, He's playing an Epiphone acoustic. He's a Beatle - couldn't he afford a Gibson J-200, or a Martin? But I also would have admitted that McCartney's playing, for all its inelegance, was spot-perfect and beautifully conceived, with flowing chord changes effortlessly anticipated by bass runs. 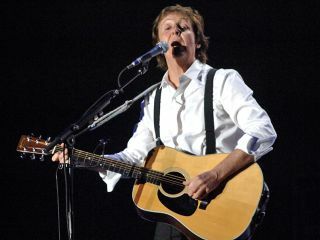 The interesting thing is that while Paul McCartney himself, now 62 years old and a long way from Yesterday, would relate more to the response of my juvenile self and pre-teen brother and cousin, he would to some extent agree with the hypercritical and elitist observations his performance would probably evoke today. This is clear because McCartney met with Guitar World Acoustic recently and, for the first time, offered a detailed assessment of his acoustic guitar playing - perhaps the one aspect of his, let's face it, miraculous talent that is underrated. Even as he speaks in considerable detail of some of the inventive and memorable acoustic guitar parts he played as a Beatle and in his solo career, he says things like, "You know, I'm not really technical," and, "I never learned the proper way of picking." With regard to his guitars, he insists, "I was never really so concerned about the instrument as I was about the song." It's usually the case that brilliant guitarists who denigrate some aspect of their playing, or claim to be disinterested in their gear, are as believable as football strikers who claim to not worry whether they're scoring as long as the team wins. You can believe McCartney, however, a man who indeed does not play the "right" way, and who hasn't filled his basement with rare and delectable guitars - or basses, for that matter. As for his overriding concern about the quality of his songs, his records speak for themselves. Paul McCartney is a great acoustic guitarist in the same way Creedence Clearwater Revival's John Fogerty is a great electric player - while neither is a master technician, both are able to create melodic parts that take up permanent residence in the minds of their listeners. And like Fogerty's best solos, McCartney's accompaniments, from the harmonically sophisticated chords of Michelle to the celestial counterpoint lines of Blackbird to the wistful-sounding inversions of Junk, were clearly devised for the sake of the song, to be integral parts of the whole. Gibson is issuing a replica of the Epiphone Texan acoustic guitar you used to record Yesterday. What made you decide to give them the go-ahead? "Actually, though I'd seen others do that sort of thing - signature guitars - it was just never anything I got involved with. But I believe it was the charity component - the money that's going to Adopt-A-Minefield - that made me think it was a good thing. "Then, after many years, I started to play the Texan again, using it on my tour, and I actually saw an old bit of footage of me playing it. I said to my guitar tech, John Hamell, Wow, you know, it really is a pretty historic instrument. I don't ordinarily think of my instruments as historic; they're just my guitars. But seeing it up on the screen like that gave me a certain perspective about it. "From then on, it just became kind of exciting, trying to re-create it. Then, while going back and forth on the guitar's preparation with Gibson, I realised that this whole thing is a pretty cool honour." "It's crazy, really (laughs). But the exciting thing for me is that they play well, these new guitars. In fact I did say to Pat Foley, who ran the project for Gibson, It's all very well getting the cracks and the crannies right, but I want it to be a guitar that sounds good. And it does." "The terrible thing about me is that I got locked in a mindset that I picked up from my dad. He really ground it into me to never be in debt, because while we weren't on the poverty line, there wasn't much money to go around. "The first time I wanted a guitar, I bought an Epiphone Zenith 17 for £15 pounds on hire-purchase, so I had to pay such and such an amount every month. It sent a bit of a shudder through my dad - I could see the look of horror on his face, his sense of, Whoo, that's debt! He used to say, Never get under an obligation to anyone. "It was great advice, but it did lead to my always tending to look for a great instrument, yes, but one that was reasonably priced, even when I could afford stuff. It was many years before I ever got a Fender bass, even though I thought they sounded terrific. "The Hofner (violin bass) I played, it was kind of symmetrical and looked good upside down, but I liked that it was also a well-priced thing. I think I saw the Epiphone the same way: they were never really top-of-the-line, but my dad had ingrained in me a certain way of thinking, and I don't think I've ever lost that." Can you recall anything besides Yesterday that you wrote or recorded with the Texan? "I'm a bit hopeless on all that - I actually can't remember what I wrote on what. I'm really the least technical guy ever, which can sometimes be a bit embarrassing. If I listened to a bunch of songs I might be able to say, Yeah, that was that guitar… but really, I'm very sort of nonchalant about what I play. "I just pick up what feels good on a given day. If I played a Martin yesterday, I may say, Oh, I'll play the Epiphone today, or, Wait a minute, let's get the Gibson Everly Brothers guitar out." Let's talk about some of your greatest acoustic guitar-based Beatles songs - how they came to be written and how you play them. You have in the past asserted that the melody to Yesterday came to you in a dream. Did the fingerpicked guitar part also appear in the dream? "No (laughs), there was no guitar in the dream. It was just a tune, and when I woke I fell out of bed and went over to a piano nearby." Do you usually write on piano? "Either acoustic guitar or piano - it's kind of split between the two, I think…"
You recorded Yesterday in the key of F, but lowered your strings a whole tone so you could play it in G. Was that because it made it easier to play the bass runs? "That's one reason. Also, I think I just wanted to play it in G but that key was just a little too high to sing in. The other possibility is that F is a better key for the string quartet we used in the arrangement." "A lot of people think I can do proper fingerstyle, but when you see me up close, you realise I can't. John and I wanted to learn the formal style of fingerpicking, but I never got around to it. He did, and he used it on Julia and some other things. "I never really got into it, but I love the sound so much, so I just figured out my own way of doing it: that's really how I learned every instrument I play. On things like Yesterday and Blackbird I just hit the bass string and sort of flick the high strings." And that's how you always play acoustic guitar, is it? "I use a flatpick on more chordal stuff, but I did a bunch of that, yeah. It's my own goofball version of fingerpicking. The main drawback to my approach is that because of the way I flick the chords and notes with my finger, it wears my nail down. "A couple of years ago, my [then] wife Heather suggested that I put an acrylic nail on. I said, No, I can't do that! But I did do it on the last couple of tours and it works like a dream." And wearing an acrylic nail hasn't made you feel like less of a man? "I still feel like a man - a full-grown man." You don't appear to regard your fingerpicking skills all that highly, yet you somehow came up with Blackbird, which is a fingerstyle masterpiece. How did you "dream" that one up? "You know how when you're a kid, you learn these little show-off pieces? Well, George and I learned Bach's Bouree In E Minor. Actually, we just heard it a few times and bastardised it. I sort of borrowed its approach in Blackbird, those kinds of intervals, and just made it up as it led on. It was the only time we ever got vaguely classical." "(Laughs) I like that, I will remember that." Michelle, another Beatles classic, features some fairly sophisticated chords. You grew up playing fifties rock 'n' roll - Elvis, Gene Vincent, Eddie Cochran - so when and where did you learn something like, say, the second chord in Michelle: the F7#9? "First of all, Eddie Cochran was one of the most underrated guitarists around. But I'll tell you exactly where I learned that chord: from Jim Gretty, a salesman at Hessy's music shop in Liverpool. All the guys who worked in that store when we were kids were jazz guys - they had to play jazz well if they wanted to hold down their jobs. Gretty showed us jazz chords, which is exactly what we called 'em." "Well, it's too bad, I'm afraid - I'm still going to call them that. You know, that F7#9 is a beautiful chord, and it was outside our frame of reference because nothing that we listened to contained that chord. "I remember George and I were in the guitar shop when Gretty played it, and we said, Wow, what was that, man? And he answered, It's just basically an F, but you barre the top two strings at the fourth fret with your little finger. We immediately learned that, and for a while it was the only jazz chord we knew. Later we learned other chords from him." How did your knowledge of those chords lead to your writing Michelle? "I used to take a guitar along to parties and sort of sit enigmatically in a corner, hoping it would attract a girl. I remember that I actually pretended at one of these parties that I was French, you know, wore a black collar-necked shirt, and sort of enigmatically played this little fingerpicked instrumental that went like this: [sings] Ding ding ding, and then that doon din, which was Gretty's F chord with the pinky barring the two strings at the fourth fret. "Years later John said, Remember that French thing you used to do? We should stick some words on that." Let's return to The White Album, which features more of your acoustic playing than any other Beatles record. Mother Nature's Son begins with a descending riff played over a partial chord on the treble strings. It's quite similar to the guitar intro to Michelle, and variations of that same pattern can also be found in Junk, from your first solo album, and other songs. "That chord sequence was just the kind of thing I heard growing up. My dad was very musical - he was a professional musician and used to play the piano at home - so I grew up musical, and I had a naturally musical ear. "There were things I heard that I just fell in love with, and was sufficiently interested in and musical enough to go, Wait a minute, what was that? Oh, I see what they're doing, just this one note in the chord is descending. So I'd figure it out and then it would become a favourite little thing of mine. And I inserted the kind of things I heard back then in my songs to sort of refresh things." Exactly what kind of music did your father play? "Well, it wasn't skiffle, it wasn't blues, it wasn't rock 'n' roll - it was standards, music I listened to from the day I was born. Things like Stardust - I really liked Hoagy Carmichael. And I still go back to a lot of that stuff because it gives me variety in my writing, gives me places to go when I'm looking for a surprise." How did you apply those little, refreshing things when writing for The Beatles? "Me and John would come in with our acoustics and start with E, A and B chords, and then we'd throw in, like, a C# minor seventh. It'd be very exciting - I still remember the palpable thrill of finding a chord that we hadn't used before. It can empower you to write five songs, or help make the one you're writing better." The first two albums you released as a solo artist, McCartney  and Ram  were jam-packed with great acoustic guitar tunes - Junk, Teddy Boy and Heart Of The Country - and you also released Another Day as a single back then. Was there any particular reason that you went in such an unplugged direction? "When I worked with The Beatles there were at least two guitars, and when I played there were three. We would often play a song through on acoustic, and sometimes we'd develop it from there on electric - or sometimes we just kind of liked it where it was, and it stayed acoustic. On those early solo albums I didn't have the guys I developed things up with - John and George - and so things often remained acoustic. Of course, I also liked how it sounded [laughs]." Do you ever use altered tunings? "I play everything in standard tuning, except that sometimes I'll lower the bass E string to D when I'm playing in D. You know, we have a performing arts school up in Liverpool (LIPA), and in the prospectus of the music department I saw this item: we'll show you the special tuning for Blackbird. And I thought, You'd better show me that, guys, before we go any further!" Do you recall taking any specific approach to recording acoustic guitar with The Beatles? "You know, this is the truth, man, people analyse our stuff much more than we ever get around to. So you probably have a better answer to the question than I do." Who were some of your favourite guitarists when you were growing up? "Well, my interest in fingerpicking came from Chet Atkins. I remember a lot of us tried to learn Trambone, an instrumental that's on an album of his called Down Home. Otherwise, I loved Carl Perkins, Chuck Berry, Buddy Holly and Lonnie Donegan's guitarist, Denny Wright, who was fantastic. I liked acoustic folk playing by Woody Guthrie and Ramblin' Jack Elliott." Were you ever a big country blues fan? Songs like Three Legs (from Ram) and Bip Bop (from Wings' debut Wild Life) have a rural blues flavour about them? "I listened a lot to Leadbelly, to all of those guys. But I never got stuck in one groove. One day it would be, Oh wow, Chuck Berry! And the next, Oh wow, Scotty Moore! I was a bit of a magpie, really, picking up various styles and gradually assimilating them. It's probably a bit of the same in my vocal thing, you know? "I loved Elvis and sang some songs trying to be like him, but then I also had my Little Richard stuff." In Man We Was Lonely, (McCartney), you sound like Buck Owens in the chorus and Paul McCartney in the verses - like you're doing a duet with Buck Owens? "Actually, I thought of myself as Johnny Cash on that one. Johnny could have done that one right! I remember playing that to him and June (Carter-Cash), in fact." What is your main acoustic these days? "A Martin, but don't ask me for the serial number. It's one of my old ones." You bought a D-28 in 1967, could that be the one? "That's it. Actually, I have a few home bases and have an acoustic in all those places - I always have one waiting wherever I'll be." How do you go about getting your acoustic sound in the studio these days? "With the help of a great engineer (laughs). And that's always been my advice to those who want to know how to get a great sound: get yourself a great engineer. Seriously, they just put a mic up and I go, That sounds nice. And if it doesn't I might fiddle with it a bit, but normally I credit the engineer. "Here's a story that shows how low-tech I really am: I went into an instrument store in New York, and this guy recognises me and says, Oh man, I'm a bass player and I've always wanted to know what strings you use. And I swear I wasn't trying to be funny when I said, Kind of long, shiny ones. And I actually don't know - it's not really important to me. I will play on anything and everything because I'm genuinely not too fussy about gear. The playing and the song are more important than the equipment." Do you play much acoustic these days? "Yep. Just last week, I finished up a few songs that are either acoustic or piano-based." "Next month I'm going to be in Los Angeles to do some recording. I'm doing an album that's being produced by Nigel Godrich (Radiohead et al). But we're not actually looking to release anything until this time next year." How would you characterise the level of your enthusiasm for music these days? "You know, I'm still excited about what I do - I love it. I think the tour in America that started with the Concert For New York [a post-9/11 tribute] really sort of revitalised me. The American audience has been so cool, so warm and informed and receptive." "It's taken from Here, There And Everywhere. It just seemed to sum up the tour. We went out with this inexplicable spirit that just caught everyone in the crew. We all really believed in what we were doing!"